Hijrah (Migration or Immigration) was established by Prophet Muhammad (peace and blessings be upon him) as he twice ordered his Companions (Sahaba) to immigrate to Abyssinia to preserve their faith when the disbelievers in Makkah began torturing them severely. Prophet Muhammad (peace and blessings be upon him), however, remained in Makkah calling people to Almighty Allah, in spite of the great harm he received. Then Almighty Allah permitted him to immigrate to Madina. Prophet Muhammad (peace and blessings be upon him) allowed his Companions (Sahaba) to go to Madina, and, accordingly, they began immigrating, leaving their homes and properties, seeking the bounties and satisfaction of Allah, and helping Allah's cause and His Messenger. Almighty Allah praised those Muhajirun (immigrants to Madina) and promised them great reward. That is why Hijrah (Migration or Immigration) is mentioned in the Noble Qur'an associated with Jihad. Further, the Muhajirun (immigrants) became the best of the Prophet Muhammad's Companions (Sahaba), as they sacrificed everything one may cherish; namely home, property, family, and relatives, in order to preserve their faith and to please Almighty Allah (SWT). This is, in fact, a strongly worded threat to whoever neglects Immigration, when needed, without a legal excuse. 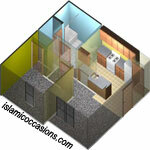 Allah's earth is spacious, and without doubt, there are many good places where one may practice one's religion freely. As the dream of most parents I had acquired a MBBS degree in India and passed USMLE (Canadian Residency Program) to enter Canada, the land of braves and opportunity. When I arrived in the Canada after my Immigration, it was as if a dream had come true. Here in Canada at last I was in the place where I wanted to be. I decided I would be staying in Canada for about Five years in which time I would have earned enough money to settle down in India. My father was a government employee and after his retirement, the only asset he could acquire was a decent one bedroom flat. I wanted to do some thing more than him. I started feeling homesick and lonely as the time passed in Canada. I used to call home in India and speak to my parents every week using cheap international phone cards. Two years passed, two years of Burgers at McDonald's and chicken legs in KFC and discos and 2 years watching the foreign exchange rate getting happy whenever the Rupee value went down. Finally I decided to get married. Told my parents that I have only 10 days of holidays and everything must be done within these 10 days. I got my ticket booked in the cheapest flight. Was jubilant as I was actually enjoying shopping for gifts for all my relatives and friends back home in India. If I miss anyone then there will be talks. After reaching home in India, I spent one week going through all the photographs of girls and as the time was getting shorter I was forced to select one candidate. In-laws told me, to my surprise, that I would have to get married in 2-3 days, as I will not get anymore holidays soon and they cannot wait for long. After the marriage, it was time to return back to Canada, after giving some money to my parents and telling the neighbors to look after them, we (I was lucky and managed to get the visa of my wife early) returned to Canada. My wife enjoyed this country Canada for about two months and then she started feeling lonely. The frequency of calling India increased to twice in a week sometimes 3 times a week as she also has to call her parents. Our savings started diminishing. After two more years we started to have kids. Two lovely kids, a boy and a girl, were gifted to us by the Almighty Allah. Every time I spoke to my parents, they asked me to come to India so that they can see their grand children. Every year I decide to go to India. But part work, part monetary conditions prevented it. Years went by and visiting India was a distant dream. Then suddenly one day I got a message that my parents were seriously sick. I tried but I couldn't get any holidays and was stuck up in the procedures and thus could not go to India. The next message I got was my parents were passed away and as there was no one to do the last rites the society members had done whatever they could. I was depressed. My parents passed away without seeing their grand children. After couple more years passed away, much to my children's dislike (by now nearly cocos) and my wife's joy we returned to India to settle down. I started to look for a suitable property, but to my dismay my savings were short and the property prices had gone up during all these years. I had to return to Canada. My wife refused to come back with me and my children refused to stay in India. My 2 children and I returned to Canada after promising my wife I would be back for good after two years. Time passed by, my daughter decided to get married to a French and my son was happy living in Montreal. I decided that enough is enough and wound-up every thing and returned to India. I had just enough money to buy a decent Two-bed room flat in a well-developed locality. Now I am sixty years old and the only time I go out of the flat is for the routine visit to the nearby place of worship. My faithful wife has also left me and gone to the holy abode. I lost my parents and children for just ONE EXTRA BEDROOM. Looking out from the window I see a lot of children dancing. This damned cable TV has spoiled our new generation and these children are losing their values and culture because of it. I get occasional cards from my children asking I am alright. Well at least they remember me. Now perhaps after I die it will be the neighbors again who will be performing my last rites, may Almighty Allah Bless them. There are no unanswered prayers... At times the answer is NO. A qualified Muslim medical worker from India immigrated to Canada to live a better life. This Muslim brother had a beard. He applied to many different places for a job and was called for interviews. Though he was highly qualified for the jobs, the interviewers hesitated to hire him because of his beard. One by one, he was rejected from all the companies. One interviewer actually mentioned to him indirectly that his beard was an obstacle to getting the job. Truly, it was a big test for him from Almighty Allah. Hopeless and exhausted, the Muslim brother decided to remove the obstacle, which was to shave off his beard. Then he returned to that company and requested for another interview. When the interviewer saw him without a beard this time, he refused to give him the job again. The Muslim brother became confused and asked to know the reason. The interviewer said "If you are not faithful to your Almighty Allah, how will you be faithful to us?" This true incident was narrated to us by a friend who personally knows this Muslim brother, however, his identity will remain private. In reality, obeying the commandments of Almighty Allah does not bring failure. In the beginning, we may face various problems, but the end results will be very sweet. Prophet of Allah (SAW) also faced many problems in the beginning, but in the end, he saw how hundreds and thousands of people turned towards Almighty Allah for his steadfastness. In a poor Zoo of India, a Lion was frustrated as he was offered not more than 1kg of meat a day. The Lion thought its prayers were answered, when one day a Canada Zoo Manager visited the Zoo and requested the Indian Zoo management to shift the Lion to Canada Zoo. On its first day after arrival, the Lion was offered a big bag, sealed very nicely for breakfast. 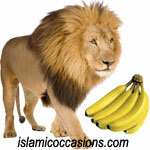 The Lion opened it quickly but was shocked to see that it contained few bananas. The Lion thought that may be they cared too much for him as they were worried about his stomach as he had recently shifted from India. The Lion was so furious; it stopped the delivery boy and blasted at him, don't you know I am the Lion ... King of the Jungle ..., what's wrong with your management? What nonsense is this? Why are you delivering bananas to me? Moral of the Story: Better to be a Lion in your own country than a Monkey elsewhere. Several years ago an Imam moved to Toronto, after immigrating to Canada. Imam often took the bus from his home to the downtown area in Toronto. Some weeks after he arrived, Imam had occasion to ride the same bus. When he sat down, Imam discovered that the driver had accidentally given him twenty five cents too much change. As he considered what to do, he thought to himself, 'you better give the twenty five cents back. It would be wrong to keep it'. Then he thought, 'Oh forget it, it's only twenty five cents. Who would worry about this little amount? Anyway, the bus company already gets too much fare; they will never miss it. Accept it as a gift from Almighty Allah and keep quiet'. When his stop came, the Imam paused momentarily at the door, then he handed the twenty five cents back to the driver and said: "Here, you gave me too much change." The driver with a smile replied: "Are not you the new Imam in this area of Toronto? I have been thinking lately about going to worship at your mosque. I just wanted to see what you would do if I gave you too much change." "Oh Allah, I almost sold Islam for twenty five cents!" Bottom-line: We may never see the impact our actions have on people... Sometimes we are the only knowledge of the Noble Qur'an someone will read, or the only Islam a non-Muslim will see. What we need to provide, Insha Allah is an example for others to see. Be careful and be honest everyday, because you never know who is watching your actions. "OH Muslims! People Will Judge Your Islamic Values by Your CONDUCT towards them and NOT By Your Performance of Religious Rituals (Salaah, Fasting, Hajj etc)"